Slow paddling through mountain lake chains offers a unique type of solitude and an entirely different way of seeing “routes”. In recent years, it’s become one of my favorite ways to travel through the mountains. The Martin Lake Chain in the Beartooth Range is a case in point. A traverse of this basin by foot, which is arguably one of, if not the most, scenic short trek in the Beartooth Range, takes only a day from what most people consider as the “top lake” (Rachel Lake, 9864′) to what most people consider as the bottom lake (Estelle Lake, 9182′), because it’s only 2.4 miles and is an easy enough day hike from a base camp at Martin or Wright Lake. In fact, most people skip Estelle, and few go “up” to Rachel, so their day trek becomes less than a mile from the outlet of Martin to the inlet of Whitcomb, and they get to see four lakes in the chain (Martin-Wright-Spogen-Whitcomb). Granted, the Rachel-to-Estelle chain is full of scenic awesomeness at every turn but it’s only a little piece of the pie, and can’t be appreciated fully in one day trip. I knew that on my first Rachel-to-Estelle traverse in 2001, I had to come back and spend some time. So in 2002, I came back and caught a fish in each lake, which required me to spend at least 10 minutes along each shoreline. I was done in a couple of hours. So in 2003, I came back and spent 3 days camping in the chain at various locations, and knew that I was starting to appreciate its intimacy. But it wasn’t until much later, while peering at the maps, that I realized that there might be stuff higher than Rachel and lower than Estelle that were worth visiting. In fact, I went to the headwaters. The highest lake in the chain is actually Silver Tarn, at 10,846′, just SW of Grasshopper Glacier, and way, way off trail. I reached it via an ardurous off trail traverse that started in the Lake Fork of Rock Creek, and then climbed through dense brush, talus, and blowdowns to Black Canyon Lake. Six miles and seven hours after leaving the car, we bivied on a windy pass overlooking the lake. After descending to and then paddling (via packraft) across the mile-long Black Canyon Lake (thus avoiding talus and cliffs), we reached the Grasshopper Moraine and more pain until we crested the hydrologic divide of the Beartooths just above Grasshopper Glacier wearing Kahtoolas and breathing a sigh of relief because we didn’t have to arrest with packraft paddles equipped with lashed picks of granite shards on the ends. We reached the crest at midday on Day 2 and enjoyed knowing that it was to be all downhill from here, with a view of Silver Tarn glistening below us. A short descent down the glacier brought us to the tarn, where we bivied for the night on a big, sloping granite slab. From here, we inflated our packrafts and kept them inflated for the rest of the trip (with a few notable exceptions), strapping them to our packs for the interim treks between the lakes that included a lot of talus hopping, scree sliding, blowdown limbo-ing, and bushwhacking. We rafted from the inlet to outlet of every lake in the chain: Silver Tarn (10868′), Two Bits (10211′), Triskele (10190′), North Cloverleaf (10130′), West Cloverleaf (10110′), Rachel (9864′), Martin (9658′), Wright (9630′), Spogen (9583′), Whitcomb (9542′), Estelle (9182′), Granite (8630′), and lots of wide spots, and fast spots, in the wild outlet creek of Granite Lake down to its confluence with Highway 212. The final route was only 25 miles (with five miles on trail at the beginning and less than a mile of “faint paths” en route), with immense – and I mean immense – on the ground routefinding challenges. I mean, how hard can it be, right? You’re just following a stream — all the way! If not for the faint trail sections here and there created by hardy fishermen, bear, and elk, we might still be trying to find our way out of there. But that’s not the important or dramatic part. 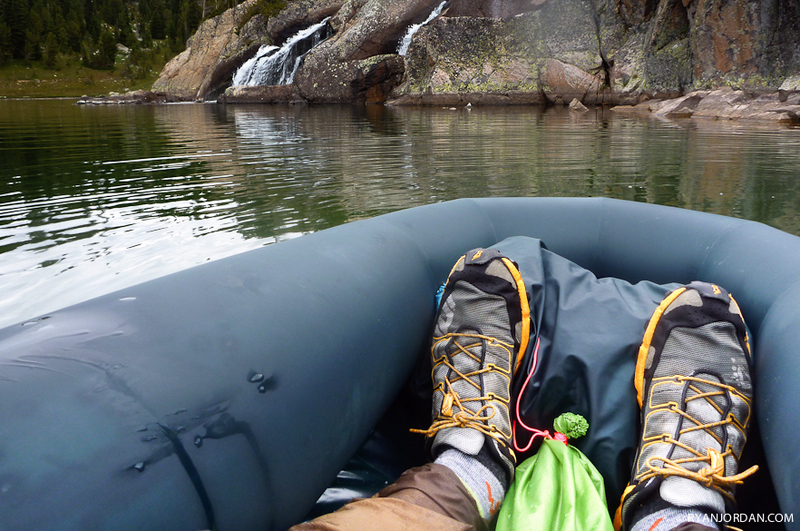 The best part of this trek was using packrafts to navigate lakes along a natural route corridor. I think this is one of the most spectacular and gratifying means of wilderness travel style: you really do become one with the drainage. Packrafting the Beartooths can sort of be like that.